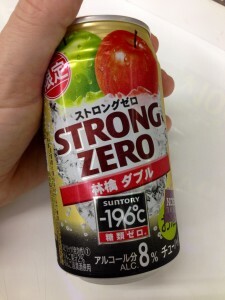 Maybe it’s just coincidence, but the latest libation available in Tokyo’s convenience stores is the Suntory Strong Zero “Double Apple” chu-hai. With the iPhone 6 and iPhone 6 Plus just released last week, this might be a genius move on the Suntory marketing team’s part—though I highly doubt it. For one, it’s just the change of season, a time when Japanese food companies fall all over themselves to rush new beverages to conbini fridges. Remember this past summer’s alcohol-infused Sake Smoothies? And second, it’s autumn! Harvest time! Apple pie, baseball playoffs, start of the hockey season, etc. (okay well not quite here in Japan, more like rice harvest time and sake brewing season… ). At least this fits the bill: crisp, cool, dry; not very sweet at all. And 8 percent alcohol. And if you’re counting calories or carbs or whatever, just remember that these “zero” drinks are pretty good for that, calorie- and sugar-wise, with only 49 kcals per 100ml (they’re 350ml cans) and 0.2g of carbs. With some cooler weather and Halloween approaching, you can bet there will be some interesting tinnies hitting the shelves next week.